South Central Eleuthera is from Savannah Sound south to Rock Sound. Savannah Sound about six miles south of Palmetto Point. It is a small friendly community comprised of mostly locals but there a lot of vacation rentals on the outskirts of town. Savannah Sound is known for its bone fishing flats and a lot of the fishing guides run out of this area. Just past about a mile past Savannah Sound is the road to Windermere Island. Windermere Island is a private gated island and if you do not own or rent a home here you are not allowed across the bridge. It has a private club with a pool, tennis courts and a dining room for guests on the island. If you want to experience what it is like to be one of the Windermere Island elite, there are a handful of vacation rentals available. Just ten more miles down the most beautiful stretch of road on the island, is Tarpum Bay. Tarpum Bay itself is arguably the most beautiful community on the entire island. I can’t think of anything I would rather do than stop at Ms. Diane's conch stand for a Kalik and conch salad on the way home after a day at the beach. On a calm day the view of the bay is spectacular. Tarpum bay is also home to a couple of markets, some great little bars and take-a-way restaurants and it is the best place to stop for fresh fish on the docks around 3 or 4pm (island time). A few miles south of town is the Tarpum Bay Shopping Center where you can anything you might have been missing such as linens, coolers, games and snorkels for the kids, grills, bikes, etc. If you take a left on the road next to the shopping center, this will take you to Winding Bay. Winding Bay is a beautiful bay known to be frequented by sea turtles. It also has a small handful of vacation homes and rentals on the southern end. About six miles south of Tarpum Bay you will pass the Rock Sound Airport and two miles later be in the heart of Rock Sound. Rock Sound is home to one of the largest grocery stores on the island along with multiple liquor stores, bars, restaurants, and other little shops. 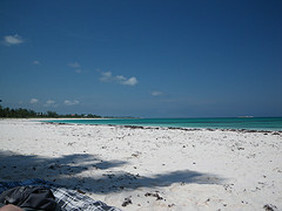 Rock sound is similar in size to Governors Harbor and the epicenter of south Eleuthera area. There are multiple beach access around the area and while you are exploring don’t forget to stop at the Ocean Hole park.